We’ve highlighted Potash mining in earlier posts. Emerson’s Douglas Morris provides and update on its developments in the global marketplace. If you follow mining, you’ve been hearing a lot about potash, particularly the dynamics revolving around global pricing. At the rudimentary level, Potash is a pretty simple mineral, potassium chloride, which is mined to extract potassium, which is supplied to the global fertilizer market. Canada happens to be the world’s largest producer of potash, followed by Russia and Belarus and it is the intersection of these three countries that makes the story of potash so interesting. Until this summer, there were two regional marketing arms (think cartels) that worked to prop up prices for this commodity: Canpotex in Canada and the Belarusian Potash Company in, well, Belarus of course. There was a bit of a shakeup this past year when Uralkali, the Russian producer left the Belarusian cartel on the 30th of July. The next day, the stock market devalued the market knowing that, without the cartels, pricing uncertainty would come into play. The breakup hasn’t changed potash prices that much, dropping only about $20 a ton in the Midwestern United States since July 30th; however, pricing now should better approximate supply. Any price drops helps farmers, but only time will tell if that translates into lower consumer prices for food. 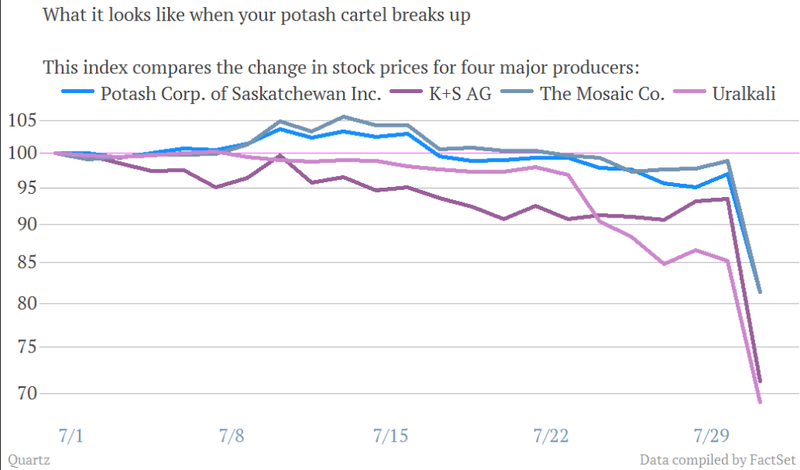 Potash producers continue to feel the effects though, as just this week Mosaic lowered its third quarter production and profit targets citing the collapse of the cartel as a cause. Despite all the uncertainty, some remain bullish on the long-term market, including BHP who is still planning to move forward with its large Jansen potash mine in Saskatchewan. Posted Monday, September 23rd, 2013 under Metals, Mining, Minerals.